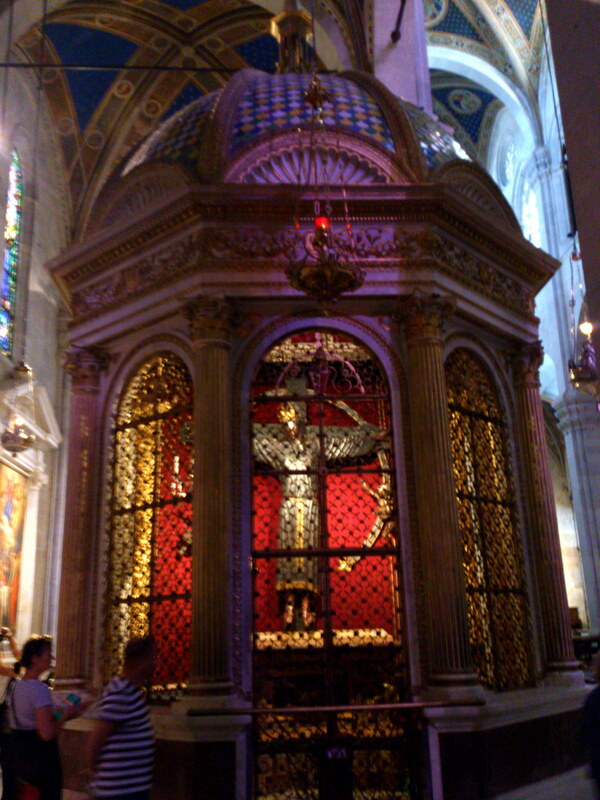 The church of San Michele in Foro, whose feet I sit is so gorgeous and delicate designed that, on its external optics, it seems to be the cathedral. 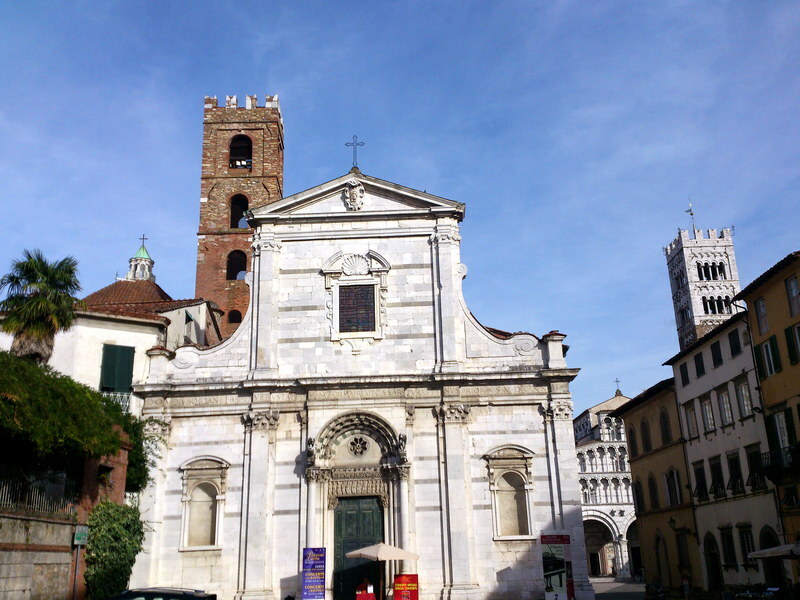 But it isn’t… St. Michael in the Forum, despite its grandeur and rich variety of forms façade is “only” the second important church in Lucca. Inside just countless technicians are at work and prepare the technology for an evening concert. Therefore – no admittance for me. And again the tower with thickets … Simply overlooked! 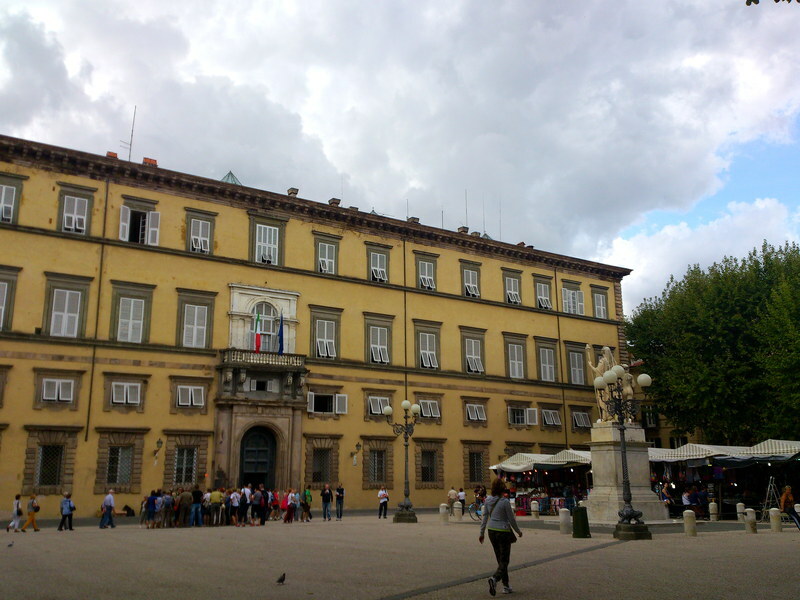 My tour leads me further on the Piazza Napoleone in front of Palazzo Ducale, the former Duke’s Palace and current seat of government of the province of Lucca. 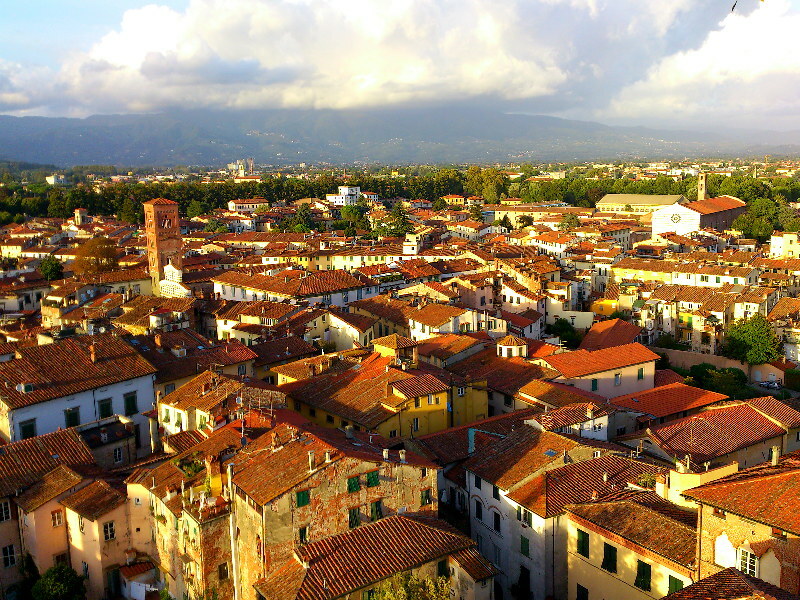 The better-known name of the square, Piazza Grande, is the more accurate description, because the place is huge. Finally, here was the fortress Augusta in the 14th century. Today the Piazza Napoleone is surrounded by majestic plane trees, – street cafes and wooden benches invite you to linger, and the big, open space seems as created for events and concerts. Today there is colorful and lively market activity, stalls with crafts and decorative items, but also with everyday objects and foods for the weekly shopping of the residents. In summer, large concerts of international stars will be held, with this setting they really must be an experience. 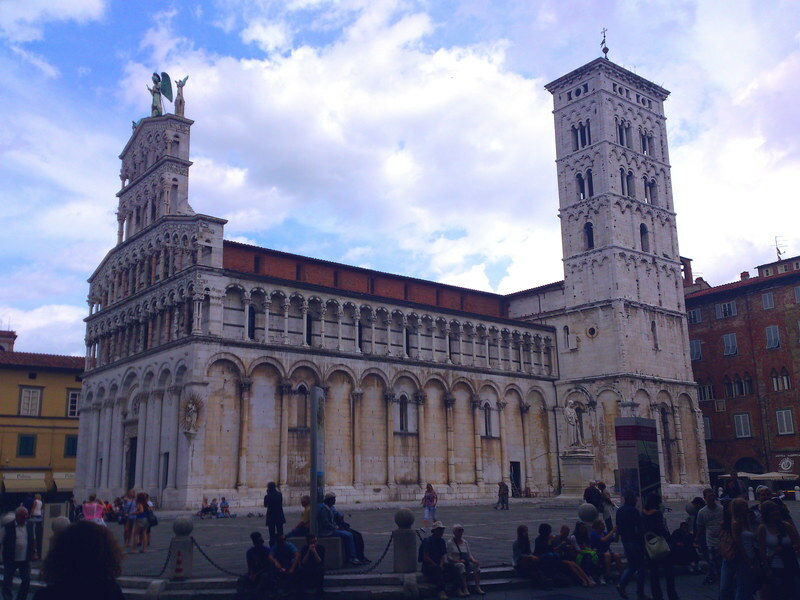 After further bummle a little over the square past the market stalls through the streets, I am soon in front of the Cathedral of San Martino, the true cathedral of Lucca. 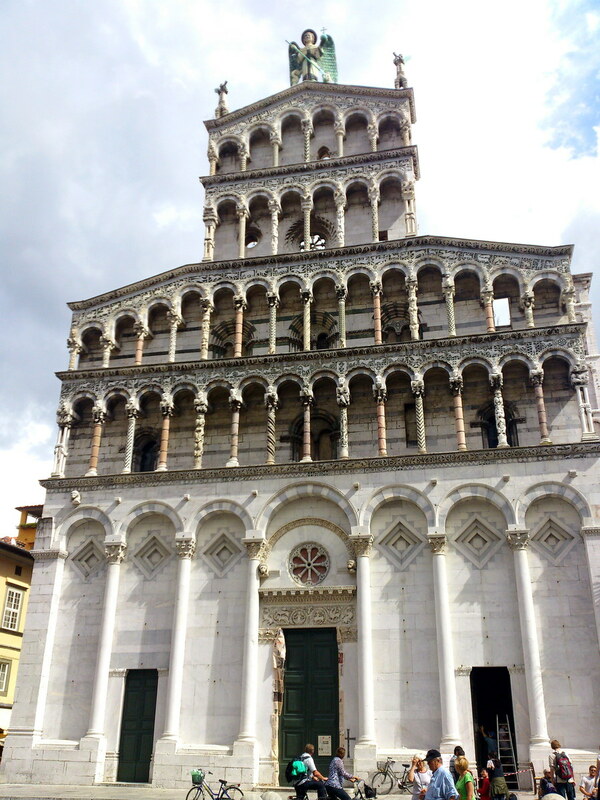 Its magnificent façade was designed on the model of Pisa, the Campanile has two colors (brown top and bottom white) and the interior with impressive ceiling paintings decorated. 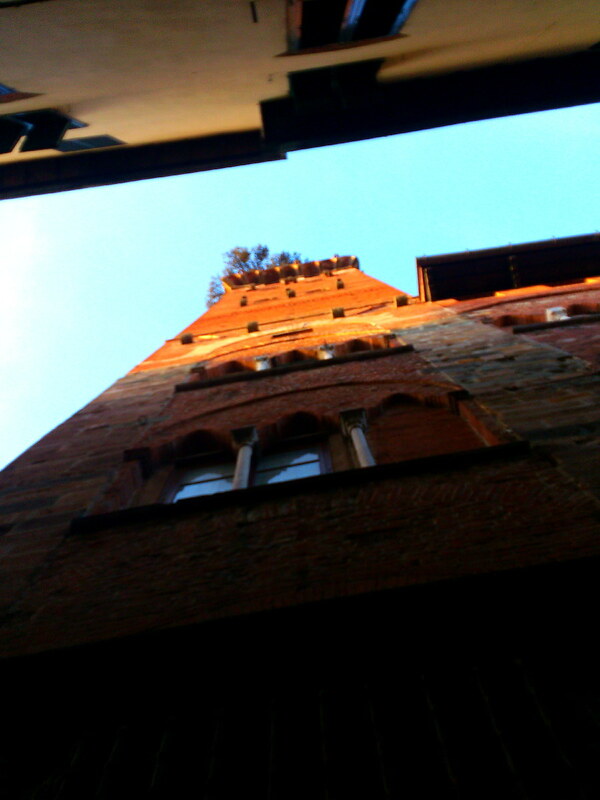 After visiting the cathedral, I decide to watch this special tower with it`s green hood. 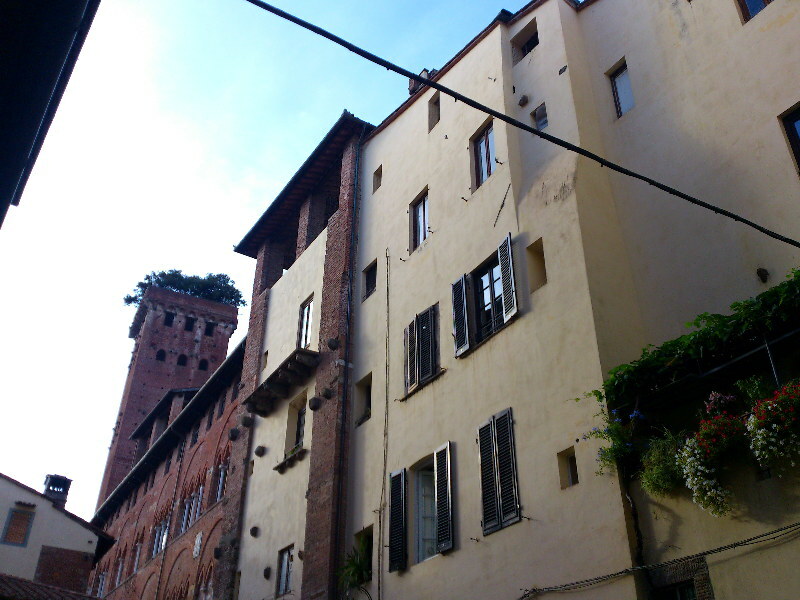 The Guinigi Tower, named after the family which built it as a residential tower to the adjacent houses and palazzos , as it was usual for rich families as a sign of wealth, and this is how the stairwell looks like. 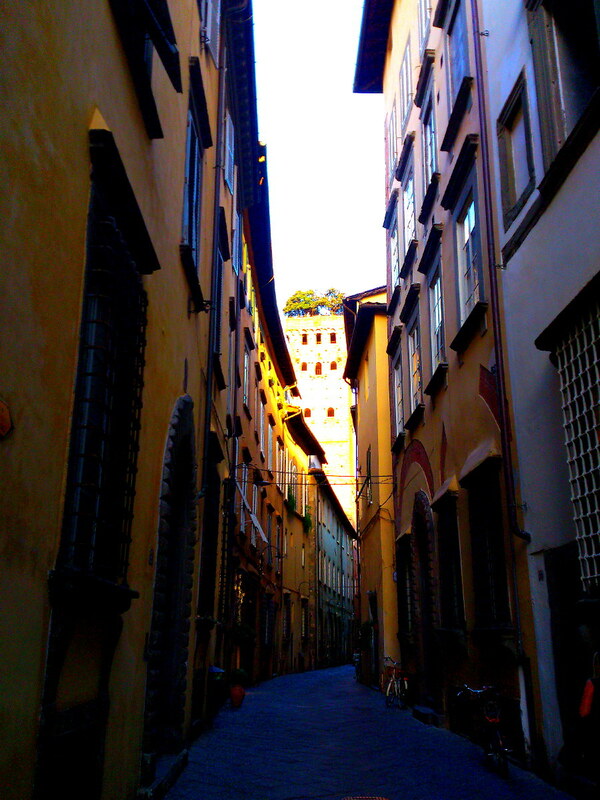 This is not a dark, narrow, creaking staircase as usual in watchtowers but a wide brick staircase. The tower is built of stone and brick, the steps are wide and of comfortable height and the walls are pierced repeatedly from skylights and windows. Very pleasant for me blind chicken with vertigo … Because I tolerate now and then a little break to accomplish at least 230 steps , I use the breathetaking breaks to admire the numerous wall decorations. Crests, paintings, flags … Only the final steps are difficult to manage, they are made of metal and are steeper and narrower than the stairs. But when I finally stretch out my head out of the hatch of the output in almost 45 meters height, I know immediately why the rise was definitely worth it (also if the staircase was not as convenient and exciting). The sight is simply amazing !!! Ancient, gnarled oaks weigh their leaves in the wind. Its branches grow out over the edge of the tower and its roots cling solidly to dry, sandy soil in stone troughs,around and in the middle through them runs the path. At the edge I sit comfortably on the bezel of the trees, enjoy the rustling of leaves above me, the chirping of birds, the play of light of the sun rays falling through the leaves, and of course the spectacular views. 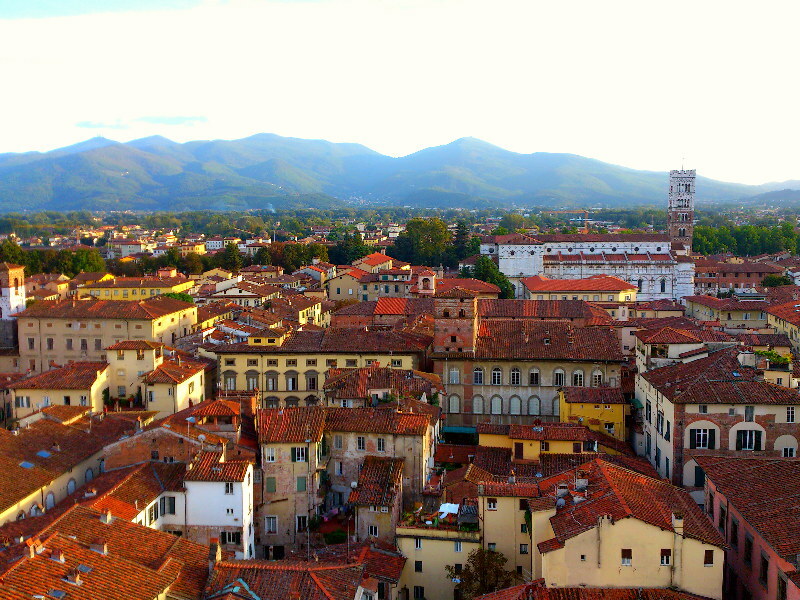 Now I realize why Lucca is also called the “city of the 99 churches”. So many are not, but still numerous steeples protrude from the roofs maze. 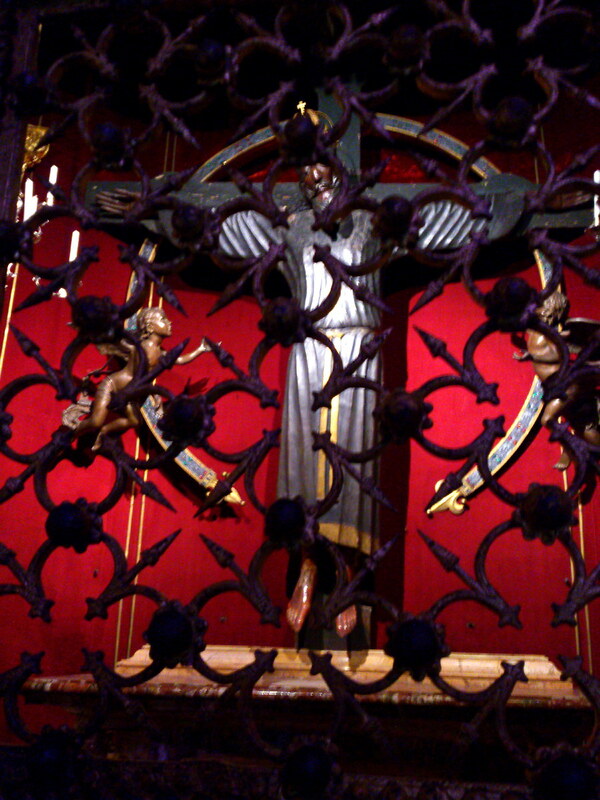 How wonderful this sight must have been in the Middle Ages? 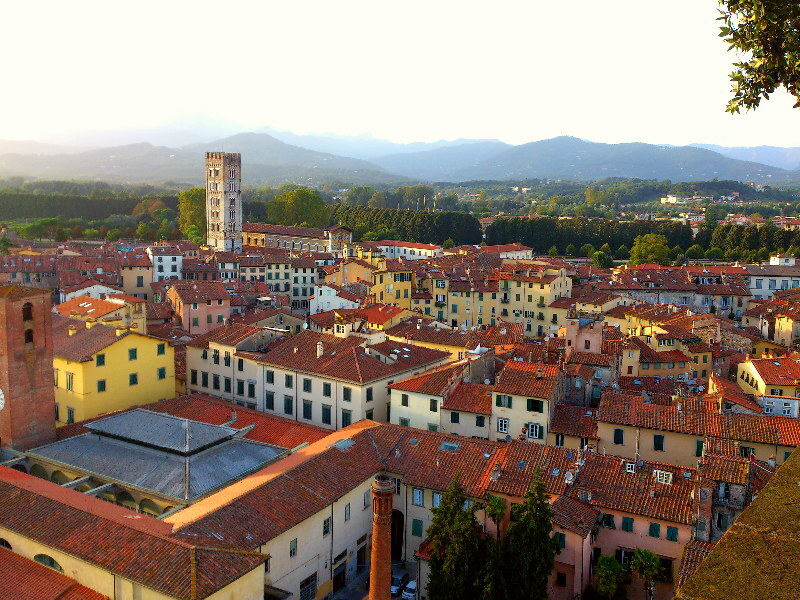 In the early 14th century in Lucca there were more than 250 such residential towers and numerous other bell towers of churches. 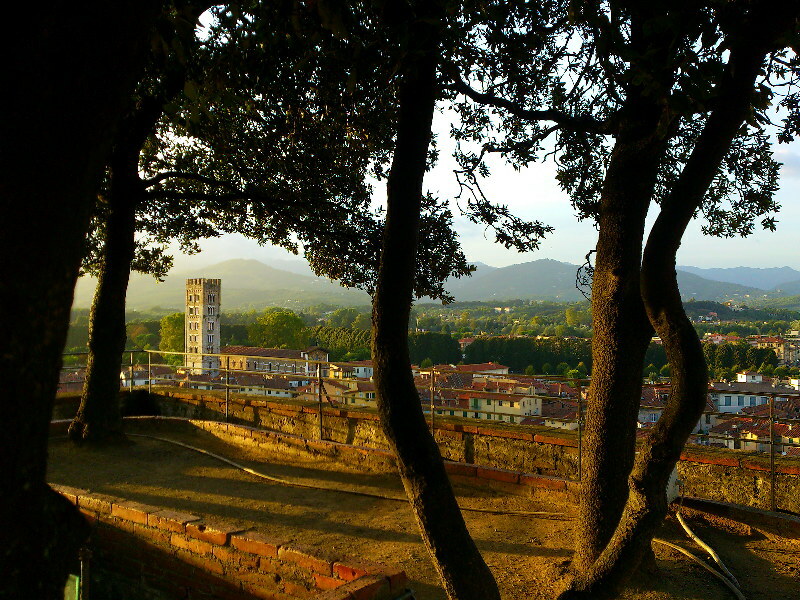 Later most of them were demolished or otherwise destroyed, the Guinigi Tower is the only residential tower of Lucca remained intact. 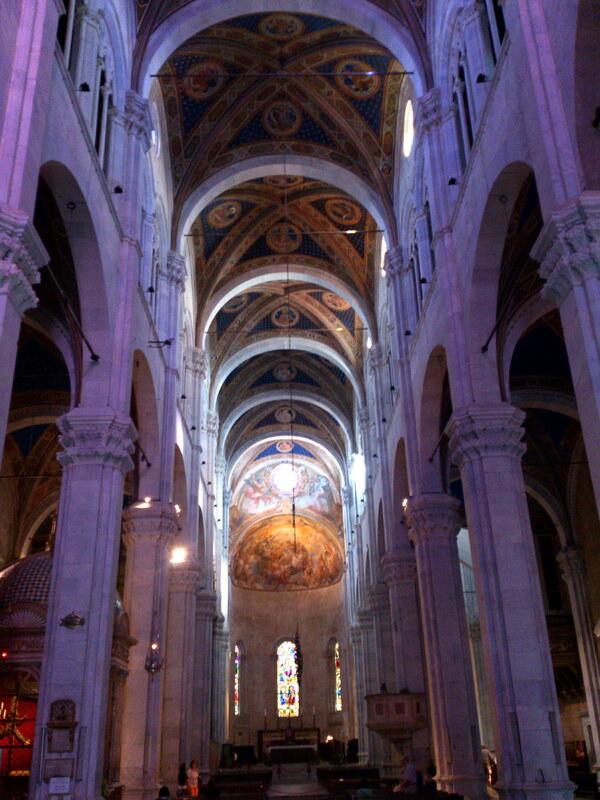 In exchange the remaining steeples radiate together with the sinking sun . 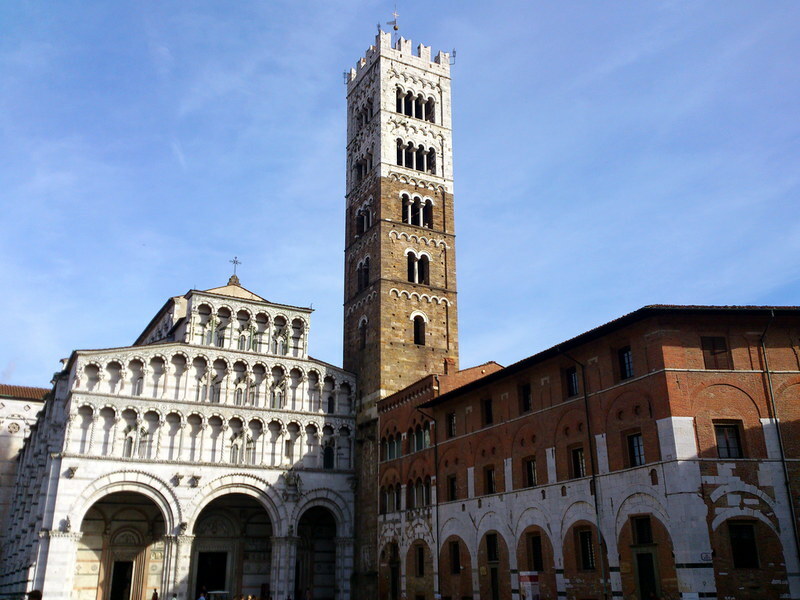 Directly opposite I clearly see the great bell of the Torre delle Ore, a little further away the white-brown tower of the Cathedral of St. Martin. 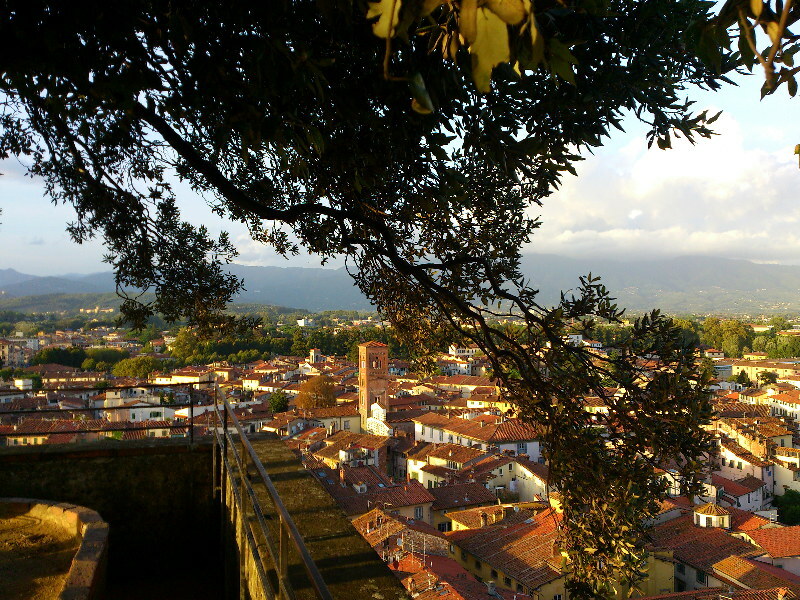 The red tile roofs of the houses spread out under me like a corrugated carpet, all bathed in soft, warm light, framed by a green belt, the planted city walls. The rolling hills behind look like sprung from a painting, puffy clouds collect on some slopes without dimming the bright blue sky. 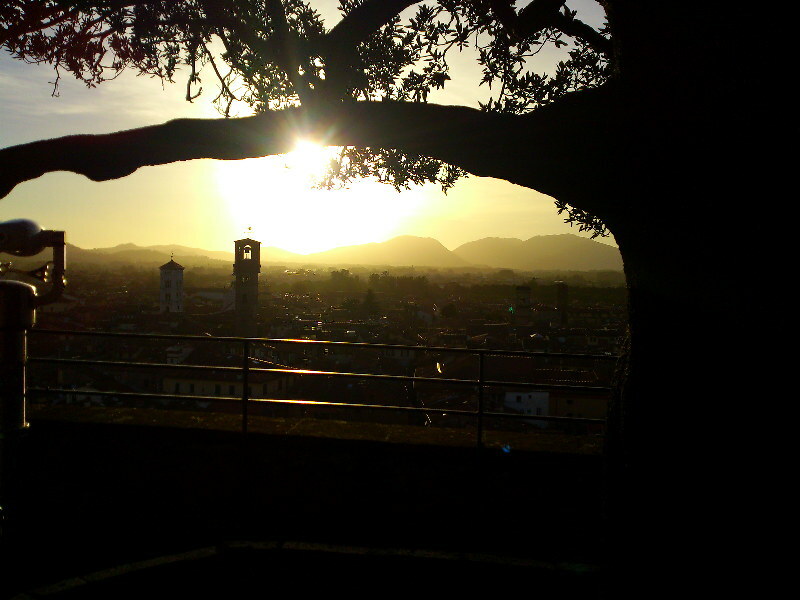 The golden light of the sinking sun – dreamlike! They wait with patience and persistence, let the sun rays penetrate through their bark in their trunk and let their insides warm. And me? Up here, I catch the sunbeams and I am – happy! “Happiness is like a sunbeam. If you want to catch it, you can’t make it. Great that you are here! Thank you for listening / reading! 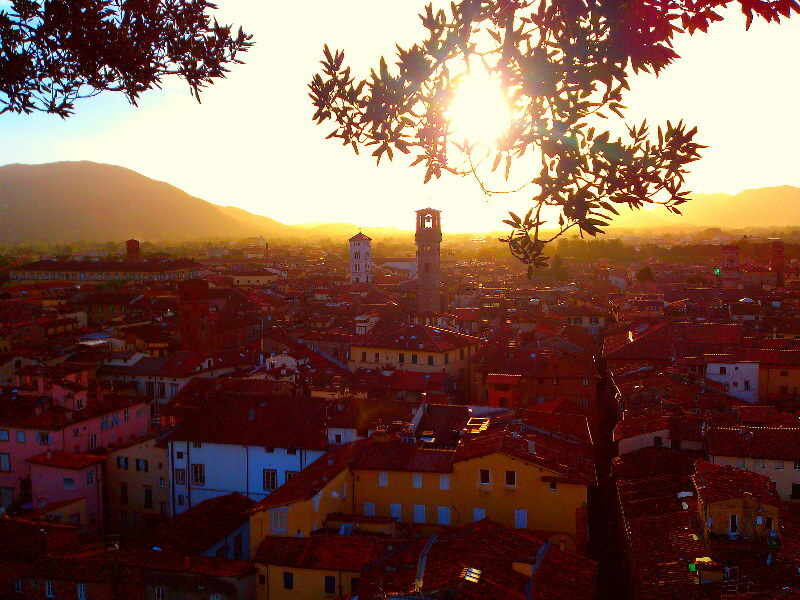 Have you ever been to Lucca? 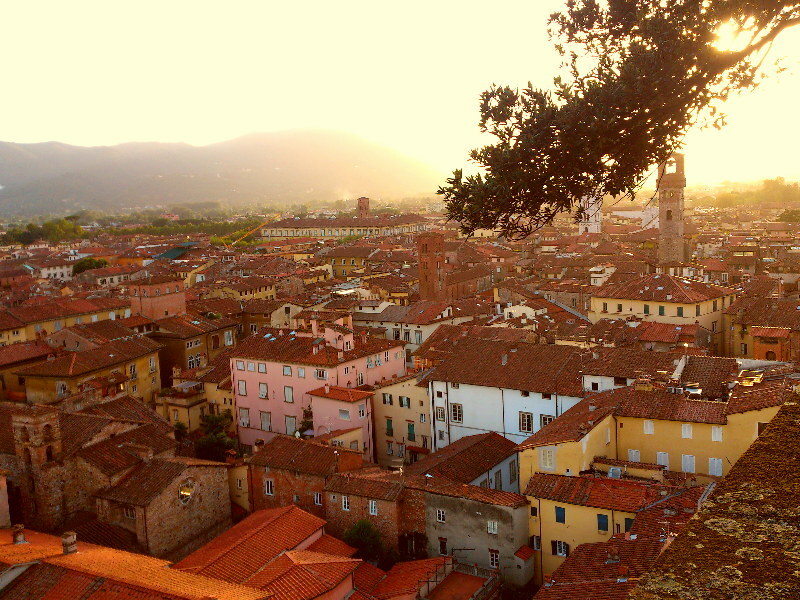 What impression did you get about Lucca because of my story? I’m looking forward to reading your comments!